Australia, New Zealand and England headline the 12 nations to feature in a World Cup nines tournament confirmed by the NRL on Monday. Papua New Guinea, Tonga, Fiji, France, Samoa, Wales, Lebanon, Cook Islands and the United States are the other nine nations. The event will be held at Bankwest Stadium on October 18-19. "This will truly be a festival of rugby league over two days," NRL chief executive Todd Greenberg said. "We will have the colour and passion from some of the Pacific nations including Samoa, Tonga and Fiji, the might of Australia, New Zealand and England, as well as some emerging nations including Lebanon, the US and Cook Islands." A women's tournament will include Australia, New Zealand, England and Papua New Guinea. The nines tournament adds to an expanded international calendar that includes the inaugural Oceania Cup that involves six nations and begins in June. Great Britain also tour New Zealand and Papua New Guinea later in the year. Prime Minister Peter O’Neill has stated clearly that he has planted a post that will hold the house (government) that is not shaky and will be very hard to remove. PM O’Neill told thousands of people at Kagua station last week at the opening of the newly-sealed Ialibu to Kagua road and the launch of rural electricity programme for Southern Highlands, that government is not shaky with 80 members of the current coalition intact. “You will hear a lot of noise in Waigani and Port Moresby that tomorrow they will change government. That noise has been there for the last seven years, so they can make noise but we are a government that delivers so wok mas go yet. “Don’t worry about this noise, our MP brothers we can argue but government does not depend on one man, it does not depend on me, it depends on team work,” O’Neill told the chanting crowd. He said he did not boast about the work the government had done in the past seven years, compared with previous governments since independence, but did not even like putting people down by name calling. “Our God is not blind, or deaf, God knows all of us, no one is clean, no man is an angel, all of us are not angels, if you want an angel to come run the country, or become MP, you wait until 2022 so you can vote this angel so all of us can work behind him. O’Neill is confident that he described the differences between former finance minister James Marape leading to his resignation as “differences with brothers” that can be managed when announcing to his people the cabinet reshuffle of Sam Basil taking over Finance and Markham MP Koni Iguan as Communications and Information Technology Minister. 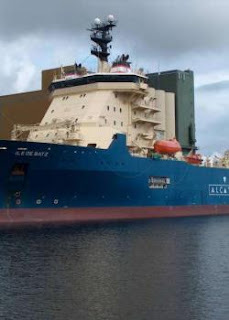 The vessel to deliver the country's undersea cable system is on its way to the Pacific, according to Solomon Submarine Cable Ltd, Keir Preedy. He said the completed undersea cable systems, the Coral Sea system (CS2) and the Solomon Islands Domestic Network (SIDN), have been loaded onto the Alcatel Ship, Ile de Batz, in Calais, France. Preedy said the vessel will lay the Solomon Islands branch back to meet the PNG branch, install the branching unit, then lay the combined CS2 cable down to Sydney for the land termination. He said the last splice on CS2 should be completed on 10 August after which the vessel will return to Honiara to commence the laying of SIDN at the end of August. Meanwhile, he said Auki will be connected to Honiara first, then the ship will lay the main body of the cable system to Western province, complete the branch to Taro, then finally the branch to Noro to complete the system by early October. The CEO said the second most important milestone is the shipping of the Solomon Islands Submarine cable's pre-fabricated cable landing stations and office buildings from the X-Site Modular in the U.S. He said these specialist data centre building will arrive into Honiara during May, saying they will be installed at Lengakiki Ridge by 31 May, in Noro by mid-June and Auki and Taro by early July. He said the Commonwealth's contractor, Vocus Communications, and their sub-contractor, Alcatel Submarine Network will then install all the required electronics in the landing stations and run the land cables from The beach landing points to the landing points through Solomon Islands Cables land ducts to complete the system.